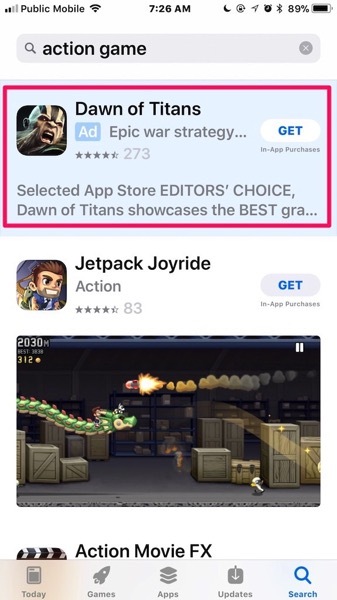 Last week Apple announced Search Ads would expand to the App Store in Canada, and as of yesterday the first ads went live. Search Ads allow developers to promote their apps through paid ads for certain keywords and categories. Ads show up at the top of search queries and are highlighted with a light blue background. Apple is offering the first $100 USD free for developers who setup their first Search Ads campaign. Developers have controls to limit their daily ad spend as well. Search Ads were first announced at WWDC 2016 and debuted last fall in the U.S., but are now available in Canada, Mexico and Switzerland as of yesterday, joining Australia, New Zealand and the UK. Let us know how often you’re seeing Search Ads in the Canadian App Store.